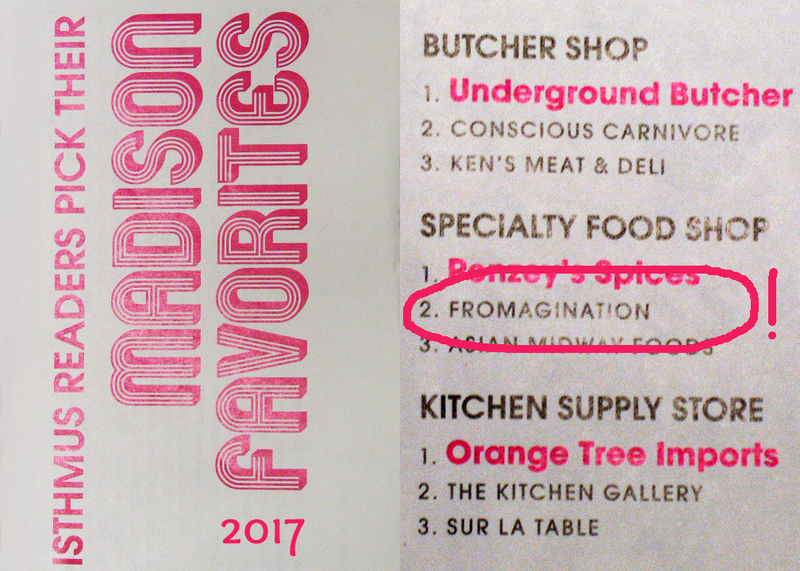 Fromagination was named an Isthmus weekly Favorite (again) for 2017! It’s an honor to get real support from the Madison/Dane County community for our business. Our shop was named #2 in the Specialty Food Shop category, behind Penzey’s Spices and before Asian Midway Foods. Congratulations to both of them…but we’re the ones who carry spicy cheese, okay? Fromagination has been named a Favorite often over our 10 years of existence. Thank you to all of our fans/supporters…wherever you are! You’ll find the Favorites listed in this week’s Isthmus, which includes the Annual Manual 2017-2018.